This clear glass star light is made using Mexican bubble glass on each pane framed by aged tin. 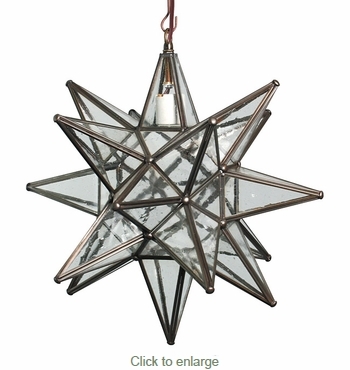 Also called seeded glass, this hanging star fixture has a unique antique look. Handmade by talented craftsmen in Mexico, it brings an authentic rustic appeal to any room in your home. This bubble glass star lantern will complement any rustic, Spanish colonial, or southwest style decor.